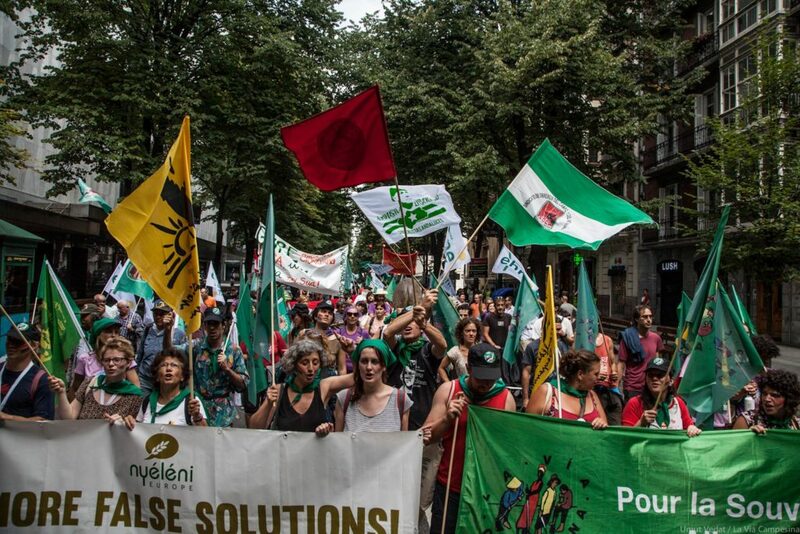 The European Coordination Via Campesina is the European voice of grassroots peasants and agricultural workers organizations fighting for Food Sovereignty in Europe and for the defence of peasants and field workers rights. Peasant Protest, they sure know how to rally. The current stage of agriculture’s industrialization in Europe lays bare the underbelly of capitalism in rural areas as well as its contradictions: the systemic and structural violations of basic rights such as the right of fair income, right to seeds, right to appropriate working conditions, and the right to produce in an ecological way. Transposed to the urban context, the violation of these rights is linked to the transgression to the right to adequate and healthy food for all. This is the outcome of agricultural, trade, workers and migrant law and policies carved out within a strong neoliberal context. 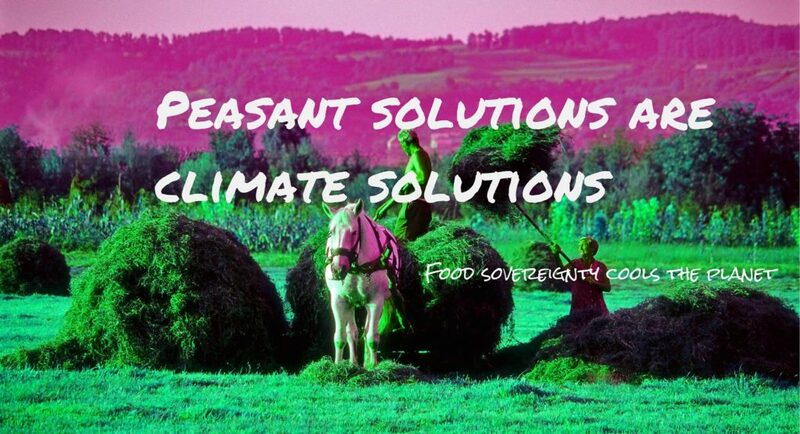 In response to this, ECVC proposes a social and economic peasant alternative consisting in the concept of food sovereignty which, in addition to reinforcing the movement and the community control of resources, food production, distribution and consumption, inextricably upholds the protection and respect of human rights, nature, as well as the guarantee of a decent life for every inhabitant. 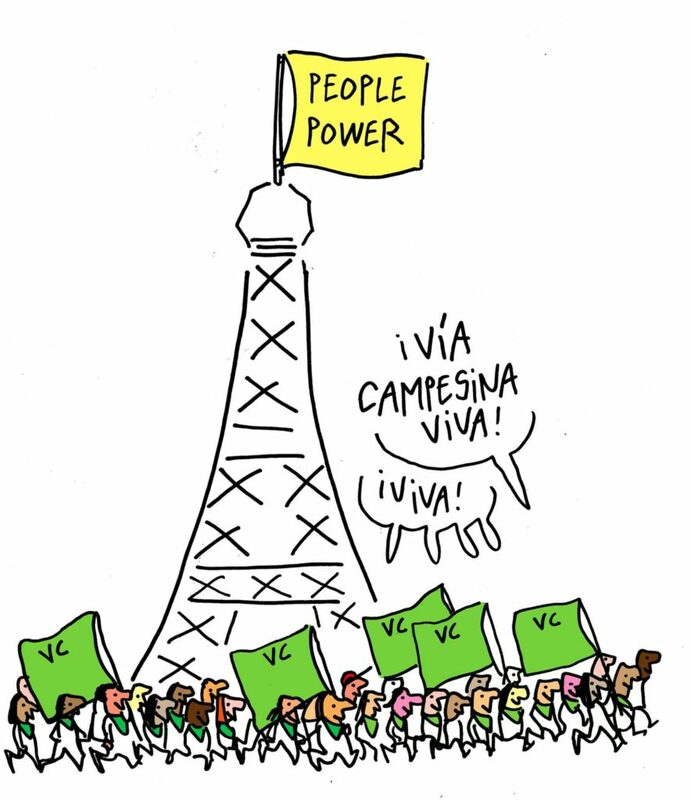 This proposal is composed of practices that are already implemented by the members of the Via Campesina movements: agroecological productions, local direct markets, collective farming, union work to defend workers’ rights, construction of solidarity and mutual systems, development of appropriate and free accessible technologies, etc. 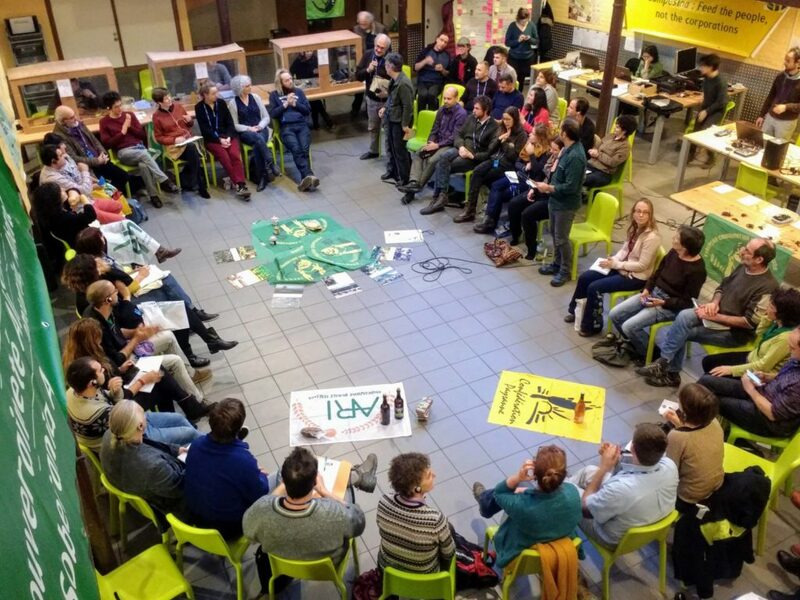 – The European coordination of different land struggles that managed to uncover the ongoing land grabbing phenomenon in Europe and the problem of access to land in particular for young farmers. One of the main outcomes of this campaign is the EP adoption of an Own Initiative Report On the state of play of farmland concentration in the EU: how to facilitate the access to land for farmers. Find a short synthesis of all their work on land in the last years here. – The EC notice on directive 98/44/EC in which the Commission concluded that the recent European Patent Office (EPO) decisions to grant patents on plants and animals obtained by essentially biological breeding processes are contrary to the European legislator’s intention (November 2017). – The development of the European Nyeleni Movement. In October 2016, more than 600 agricultural, food and social justice activists met in Romania to continue building up a European Food Sovereignty movement and to discuss how to work together to build resilient food systems. Migrants all over Europe experience an impressive violation of their human and workers’ rights while working in the agricultural sector. Several legal provisions in Europe allow the circumvention of national labor legislation such as the directive 2014/36/EU on seasonal workers from third countries, the directive 1996/71/EU on the posting of workers inside the EU or even bilateral agreements between states. Private businesses – Temporary Working businesses/Temporary Agency Work – profit from these provisions. Employers also profit sometime of the legal status of the migrants which in some cases are undocumented. 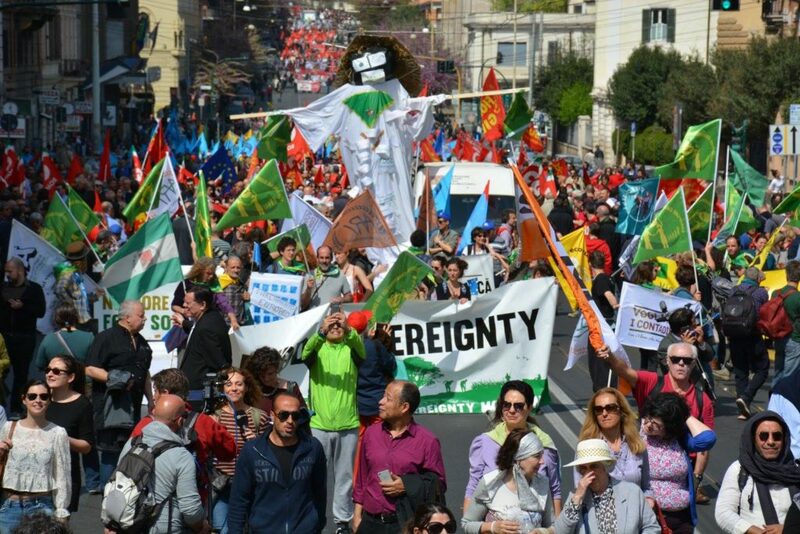 ECVC will implement a campaign targeting civil society and workers and Human Rights organizations across Europe. The aim is to inform them and then mobilize them against the violation of migrant seasonal workers’ rights in the countryside with a specific focus on the impacts of Temporary Working businesses/Temporary Agency Work and the above mentioned mechanisms at the European level allowing this exploitation. A direct action targeting European institutions will be part of the campaign. Guerrilla funding will go towards covering various aspects of this campaign’s design and implementation. In a second stage ECVC jointly with its allies also foresees to approach strategic institutions at European level in order to bring the debate at European level and open up potential spaces of negotiations on some of the main pieces of legislation impacting migrant seasonal workers. The campaign will roll out from the summer of 2018 to the summer of 2019.